Posted 6/19/2015 6:19pm by Josie Hart. We hope you all have a wonderful Father's Day Weekend - we wish you all the best! Also Happy Summer Solstice and first day of summer! Now that we have had some sunshine, gotten more crops planted, we are getting excited for the heat to help the crops produce. We hope you enjoy the fresh produce this weekend with freinds and family! If you have not yet ordered eggs with us - we are sold out. Our egg farmer is at capacity but thank you all for your interest. We do not need any egg cartons brought to us at this time. Please look for a separate email about our fruit share as it has slightly changed this year due to late season frosts with our fruit growers, Ela Farms. We will be sending out information soon about the selection of fruit and the timing! Put peas on to cook in water. Heat a little oil in skillet. Add onions and garlic scapes, sautee with herbs until tender - not more than a few minutes. After cooking peas for half/hour add onion mixture and chopped greens and cook for 20 - 30 minutes longer until peas are soft. Season with salt and pepper and/or red pepper flakes. Mkaes about 8 servings. chatfield classes - sign up now ! Growing and Using Plants for Dyeing Fri, Aug 7, 9:30 a.m. – 3:30 p.m. $67, $62 members DBG Chatfield has a dye garden full of a variety of plants that give color to natural fibers. Spend the day learning about dye plants, how to use them for color and the proper procedures for natural dyeing. Each participant will spend time harvesting dye material from the garden and then learn to cook for color. Everyone will go home with fabric samples naturally dyed from the garden! Posted 6/5/2015 10:13am by Josie Hart. We know the pickup time window may be difficult for some shareholders, but we are unable to stay past 7 p.m. because distribution days are very long for the farm team- we start harvesting at 6:30 a.m. and don't conclude the day until 8 p.m. If you can't make it to distribution between 4-7 p.m., please find someone who can help out with pick up. Thank you! Important information is regularly updated on our website. We had several concerns lately about missing the emails from us. Make sure to check your junk folder or the "promotions" tab if you have Gmail. You can add Small Farm Central to your contacts/favorites and that should ensure emails will go into your main inbox. We apologize for the mix-up regarding eggs last week, free range, fresh farm eggs will be here this week, for 20 weeks! Last year we sent out a butter/miso/honey recipe for the first round of turnips so I thought sticking with miso woul dbe a good idea! Combine vinegar, miso, sugar and pepper. Stir until miso and sugar dissolve. Pour vinegar mixture over turnips. If there isn’t enough liquid to cover them, add water. Refrigerate for at least an hour before eating. Posted 4/27/2015 12:33pm by Josie Hart. Happy Spring! We are so grateful for all this moisture! Mid-May we will start sending out a weekly e-News to share updates of what's going on down at the farm. We are expecting to start both of our weekly distributions towards the last week of May OR the first week of June. We have planted our cool season crops and they are starting to size up! Broccoli, onion, kale, chard and lettuces have all been transplanted. Beets, carrots, salad mix, hakurei turnips, bok choy and broccoli rabe (just to name a few) have been seeded and they are popping up over the soil. Each distribution will be 4-7 p.m. Please bring your own bags and we suggest recycled salad containers or ziplocks for your greens. The whole process will take about ten minutes and as we add produce it may take more time to go through the pickup line. York St. pickup: please park on the top level of the parking garage between York and Josephine streets directly across from the main entrance of Denver Botanic Gardens. Our tables will be at the south end of the top level. Chatfield pickup: please park in the upper dirt lot and walk down past the ranch buildings to our wash stand (right after the chicken coop on the left). We cannot accommodate early pickups and will always open right at 4 p.m. If you have questions please email josie.hart@botanicgardens.org. Thank you everyone and we will see you soon! Posted 3/20/2015 5:35pm by Josie Hart. We wanted to share with you a few additional farms that have CSA shares for sale if you are still looking to purchase a farm-share for this season. Please DISREGARD this email if you have already bought a share with us or another farm. Golden Acres Farm - a locally run, small scale CSA with multiple pick up locations. This very sweet family farm only has a few shares left - pick up on the farm in Wheatridge. HIGHLANDS RANCH, AURORA, BROOMFIELD, ETC. Lora's produce is beautifully grown and high quality with many pick up locations. Thanks everyone, this will be the last email you receive from us if you are not a member - our shares are sold out. Have a wonderful spring! Chatfield CSA shares on sale NOW! Posted 2/9/2015 3:00pm by Josie Hart. ...or head to our homepage and you will see member options there. You have to purchase a veggie share (either a full share or supporting share) before you purchase the additional shares we offer (eggs, fruit, jam) however you can purchase a meat share individually. All the information and prices are posted before you check out. Another choice you will have is paying in full for your share or signing up for a payment plan that automatically is taken from your account at the beginning of each month. If you have a problem purchasing your share please email josie.hart@botanicgardens.org for assistance. The wait list is on a first come, first served basis. We recommend buying your share as soon as possible to avoid being left out. We typically sell out in under 4 weeks. Posted 2/6/2015 1:30pm by Josie Hart. This is our last reminder to purchase your 2015 CSA share. Starting Monday, we will open up our sales to the waitlist and usually we sell out fast. Don't be left out from this summer's food bounty! Phil is busy seeding onion and leek varieties in the greenhouse! Next ,he will seed parsley and tomatoes. We have also made improvements to the washstand area and hope to see you all for our Open House in mid-June. 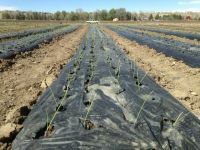 On Feb. 21 we are hosting the 2nd Annual Beginning Farmers conference at Denver Botanic Gardens at Chatfield. The conference will focus on small-scale agriculture. The event takes place 9 a.m. - 4:30 p.m. and a social hour follows until 6 p.m. Please visit www.botanicgardens.org for more info and registration. $52, includes social hour food and beverages. Posted 1/13/2015 2:20pm by Josie Hart. If you would like to have a payment schedule for all your purchases, please purchase all shares at the same time. If you add on shares you will need to pay separately for them. 2015 Front Range Beginning Farmers Conference! Posted 1/12/2015 10:48am by Josie Hart-Genter. Posted 12/22/2014 4:51pm by Josie Hart. Thanks to all of our Chatfield volunteers who made it to the holiday party- we had a great time! We sure do miss the delicious vegetables this time of year as we order seeds for next year. We would like to wish you a healthy and peaceful holiday season. In the second week of January, you will receive email information on how to renew your CSA share. All current shareholders will have until January 31 to purchase a 2015 share. In February, remaining shares will be released to the waitlist. The 2015 share will be approximately the same size as this year (dependent on growing conditions). The prices on all shares will remain the same. We will not offer the gift share. You also have to be a veggie share holder to purchase fruit or eggs shares. We have a new "Supporting Shareholder" program that we encourage you to consider in order to further sustain the farm. The focus of the supporting share will be on farm sustainability. Posted 11/14/2014 5:27pm by Josie Hart. Due to the weather, we will have distribution in Mitchell Hall, at Denver Botanic Gardens York St. location. Park in the main parking structure and cross the street to the visitor center entrance. Directly to the right of the main entrance there is the Pinon Gate entrance. A CSA staff member will be there to guide you to Mitchell Hall. The produce will include storage crops that if kept in a dark cool space will last at least a few weeks. *Supporting shareholders will receive a special box of produce including sweet potatoes and a surprise! Melt butter in a large skillet over medium heat. Add onion, fennel, apples, cranberries, sage and thyme and cook 5 minutes. Season with salt and pepper. Add turkey or chicken broth and bring to a simmer. Remove from heat and allow to cool slightly. Beat eggs with parsley in a large bowl. Add cubed bread. Pour vegetable-broth mixture in bowl and toss. Transfer mixture to a buttered baking dish and dot with butter. Cover and bake 30 minutes at 375 degrees. Uncover and bake until golden, about 30 more minutes. Grate onion and apple into a large mixing bowl, making sure not to lose any of the juice created by grating. Mix in all remaining ingredients, incorporating well but not over mixing, this could make your sausage gummy, and we want the mixture to remain light. Head a heavy bottomed skillet on medium heat with enough oil to thinly coat the bottom of the pan. Using a measuring cup or portioned scoop, create patties directly into the preheated oil that are about 1/4 cup in volume and about 1/2 inch thick. Cook on each side for 2-3 minutes or until golden brown and the chicken is just cooked all the way through. *Instead of making patties, keep this mixture loose to add to your regular stuffing mix for a rich addition! We'd like to thank all of you for such a great season. We are very grateful for being able to feed our community! We will be in touch soon with details on how to buy a 2015 CSA share. Information will include prices, share size, additional shares available and distribution times/locations. This information will be emailed to you with a timeline so you have adequate time to purchase your share before we offer shares to the wait list.